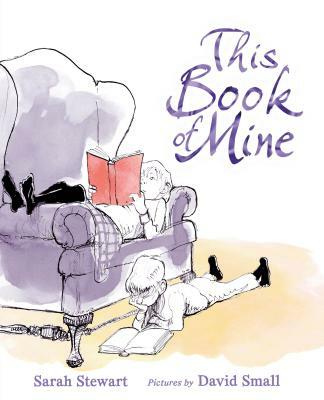 A dazzling depiction of the connection between diverse readers of all ages and their books, from beloved author-illustrator team Sarah Stewart and David Small. This Book of Mine is a celebration of the power of reading, of the ways in which books launch our adventures, give us comfort, challenge our imaginations, and offer us connection. From new mothers to fantasy lovers, butterfly hunters to musicians, the readers of This Book of Mine all share a common passion for favorite books—whether freshly discovered at the library or bookstore or saved from childhood and reread across a lifetime. A unique gift for bibliophiles young and old, This Book of Mine trumpets a simple truth: A well-loved book in hand brings color to any reader’s life. Sarah Stewart writes award-winning children’s books with her husband, illustrator David Small. Their books include The Money Tree, The Friend, The Journey, The Library, and The Gardener, a Caldecott Honor book and winner of the Christopher Award. Stewart grew up in Texas and studied Latin and philosophy in college. She has been a teacher, speechwriter, and ombudsman, among other, less notable, jobs. She has reviewed children's books for The New York Times, has edited copy for The Texas Observer, and occasionally has a poem published in an obscure journal. Stewart and her husband, illustrator and author David Small, live in a historic home on a bend of the St. Joseph River in Michigan. As a young artist I had many influences coming from some unexpected directions. My mother often took me to the art museum to expose me to culture, but at that time I felt little for the great European masters’ works hanging in their gilt frames. However, in school we had taken a field trip to the automobile factories and when, at the museum, I saw a mural about the car industry painted by the Mexican artist Diego Rivera, life and art fused for me. I suddenly realized the very real power artists have to shape our vision of the world. Here was a painting that showed something I knew about, expressing feelings about the factories that I had felt, restating my emotions and giving them order and form. Perhaps it was at that moment — standing before the great Rivera mural — that I determined to work at my talent for drawing and to become an artist. Another influence was the hospital where my father, a radiologist, worked in the X-ray department. Evenings, I would go with my mother in our car to pick my father up from work. Often he was still busy and we had to wait, so I wandered in and out of the X-ray rooms with their silent, mysterious machines, through the labs, the darkrooms, and the waiting room, where I talked with the patients. There, at an early age, I learned a lot about life and death and saw images of the living insides of the human body illuminated in the dark. Those ghostly, glowing, starkly beautiful images stayed with me. Later on, in college art classes, I jumped at the chance to study anatomy, to draw and give names to those shapes with which I was so familiar. For the other art students, anatomy was an abstraction and a bore, but for me it was exciting and very real. A third strong influence was my grandmother’s home in rural Indiana, where I spent my spring vacations as a boy. In those days — before television — we spent much of our time out of doors. In the hot afternoons I would wander through my grandmother’s big garden, or run with a dog named Butch to the bottom of a pasture to hunt for woodchucks. We would rest for a time next to a cattle trough in the shade of some huge willow trees. After dark I followed my grandfather down a corridor of trees to the train depot and watched the steam locomotives roll in and roll out. Back home again, my brother and I caught fireflies in jars and tried to read by them, or we lay around on blankets on the lawn, talking for hours beneath the stars. I’m grateful that at least part of my childhood was lived without a television set. I feel lucky to have known the world as it was back then. David Small grew up in Detroit, studied art and English at Wayne State University, and went on to complete graduate studies in art at Yale. After receiving his MFA degree, he taught at the State University of New York/ Fredonia College, Kalamazoo College, and the University of Michigan. Mr. Small’s illustrations have won him numerous awards, including a Caldecott Medal in 2001 and a Caldecott Honor in 1997. He has created over thirty books for children, has reviewed children’s books for The New York Times, and was the final judge for the 1989 Parents’ Choice Awards for Illustration. His editorial drawings regularly appear in publications such as The New York Times, The New Yorker, GQ, and The Washington Post. David Small and his wife, the writer Sarah Stewart, live in a historic house on a bend of the St. Joseph River in Michigan. They have an Airedale named Simon and a cat named Otis.